It’s not every day that a museum director asks you to help do his job. 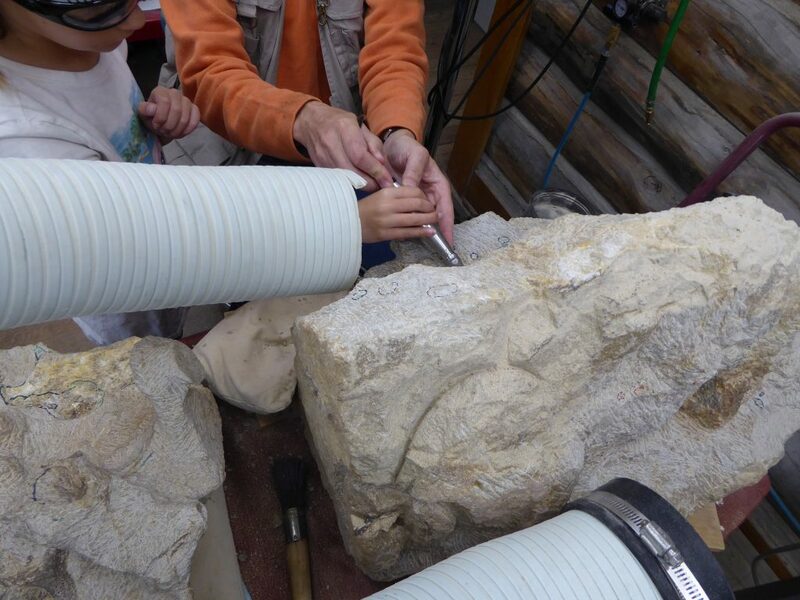 Nor is it common that an amateur and his kids get to excavate million-years-old dinosaur bones for a museum. That’s exactly what we did at the Morrison Natural History Museum, located just west of Denver, Colorado in the small town of Morrison. Disclaimer: Our family received complimentary admission to the Morrison Natural History Museum for this post. All views expressed are our honest opinions. Find out more here. Morrison was a hotbed of dinosaur activity more than 100 million years ago. After this time, the Rocky Mountains rose from the earth and the waters of an ancient lake receded, leaving a vast field of preserved bones. 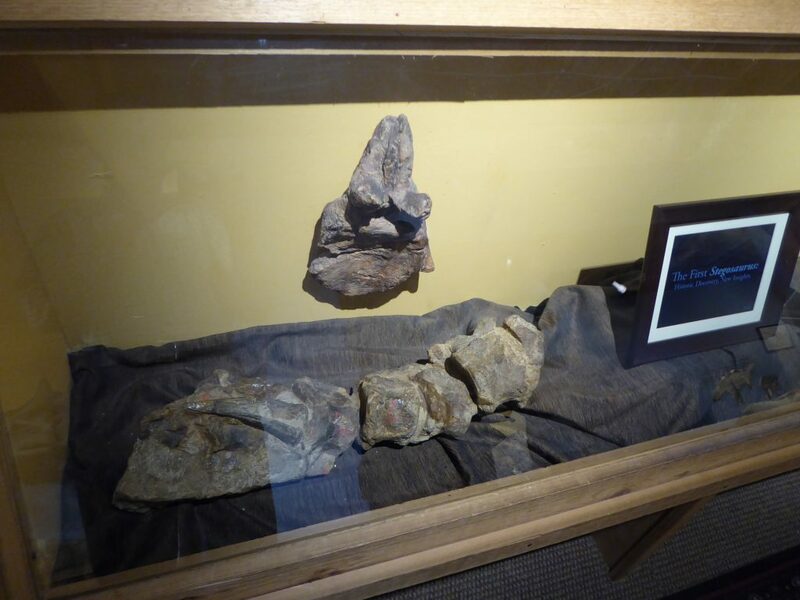 In the 1870s, fossils were found in the area, along with foot imprints encased in the once sandy banks of the lake. Morrison is one of the richest areas for uncovering and researching these beasts of the past. 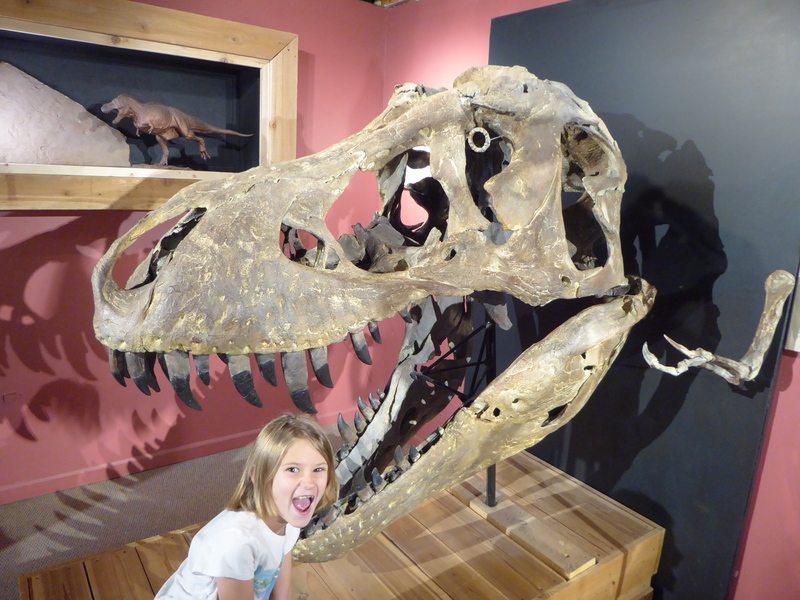 Given its history, it is no surprise to find a natural history museum dedicated to these Jurassic and Cretaceous animals in Morrison. But it is surprising to find a museum that allows the visitor such unfettered access to the exhibits. We were encouraged to touch the bones, instead of standing at a distance, merely observing these artifacts. 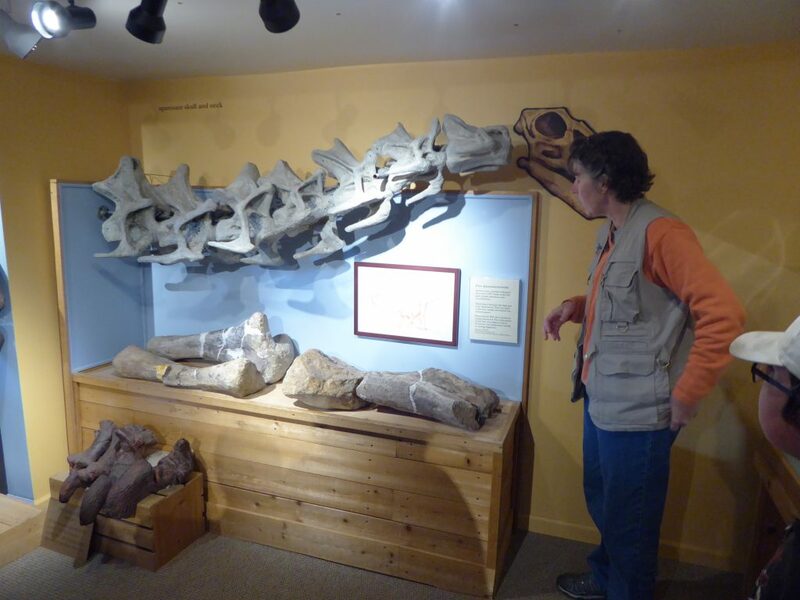 Want to see more paleontology of the Morrison area? 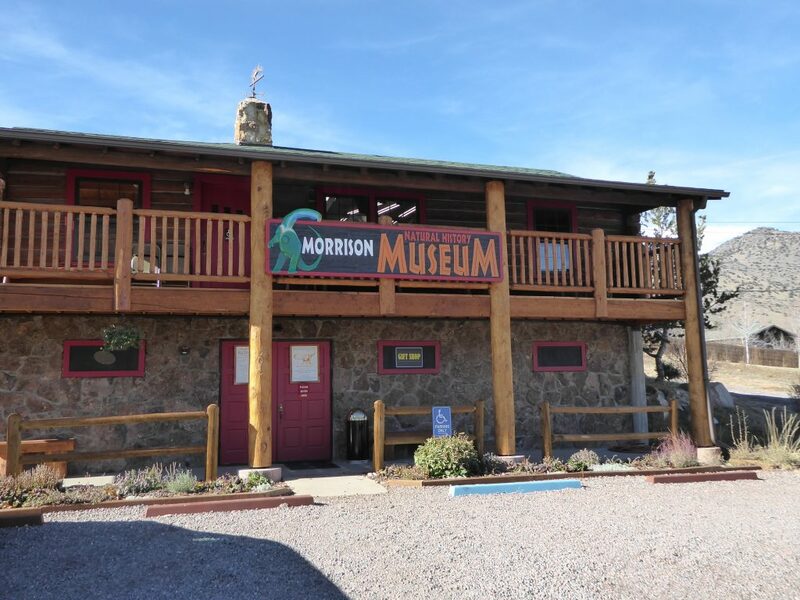 Pair a visit to the Morrison Natural History Museum with a trip to Dinosaur Ridge, a short drive from the museum. at Dinosaur Ridge, you can see dinosaur footprints left in sandstone. The museum is in a two-story building complete with a gift shop. Outside the building, there is a kids’ digging pit and examples of prehistoric flora and fauna. Inside, you will find the first discovered bones of an apatosaurus ajax and a stegosaurus. You also will find infant stegosaurus tracks, thought to be from a 20-pound animal. This Jurassic-era Apatosaurus Ajax was also first discovered in Morrison. The museum displays original and cast models of animals from the Jurassic and Cretaceous periods (which include the already mentioned animals in addition to allosaurus, T-Rex and triceratops), and specimens from the ice age (including a mammoth, saber-tooth cat, and 1,000 pound North American lion that was the size of a polar bear). The first floor features the Jurassic fossils found in Morrison, while the upper floor showcases the Cretaceous and ice-age animals. 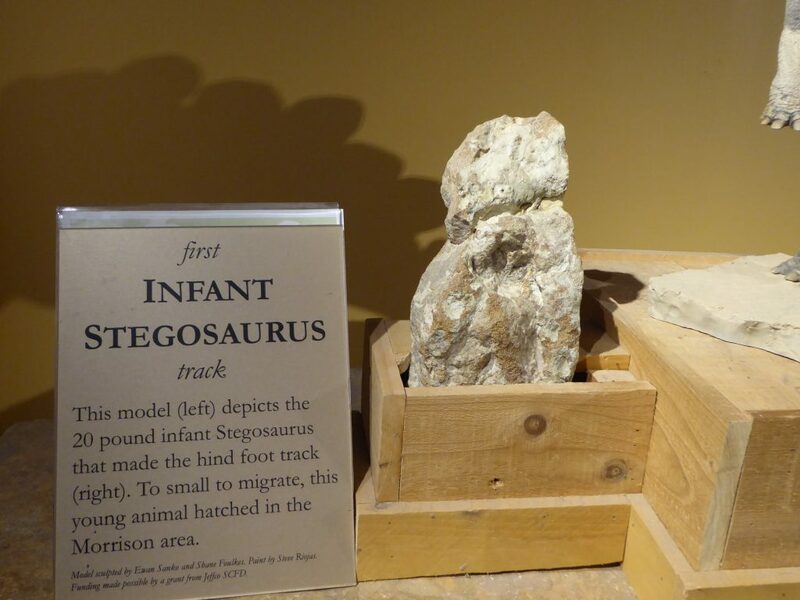 It was amazing to see this baby stegosaurus track also found in Morrison. The second floor also includes living amphibians, including a herkimer monitor lizard, snakes, and box turtles. 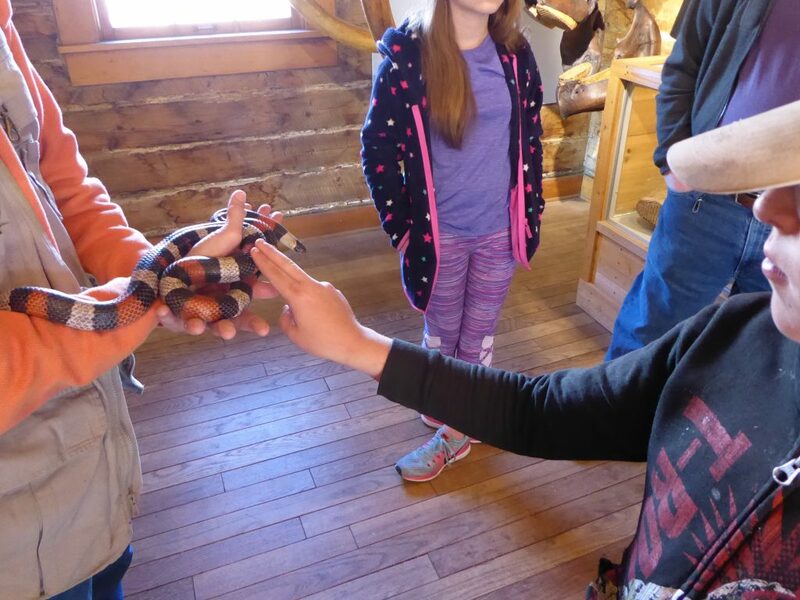 Those brave enough can touch a milk snake named Sylvia during a guided tour. My son and I got to touch Sylvia, but my daughter stayed far away. Our son petting Sylvia, the resident milk snake. For me, the highlight of our tour was going into the lab where we were able to watch Matt, the museum director, diligently clearing away the stone from an apatosaurus fossil. 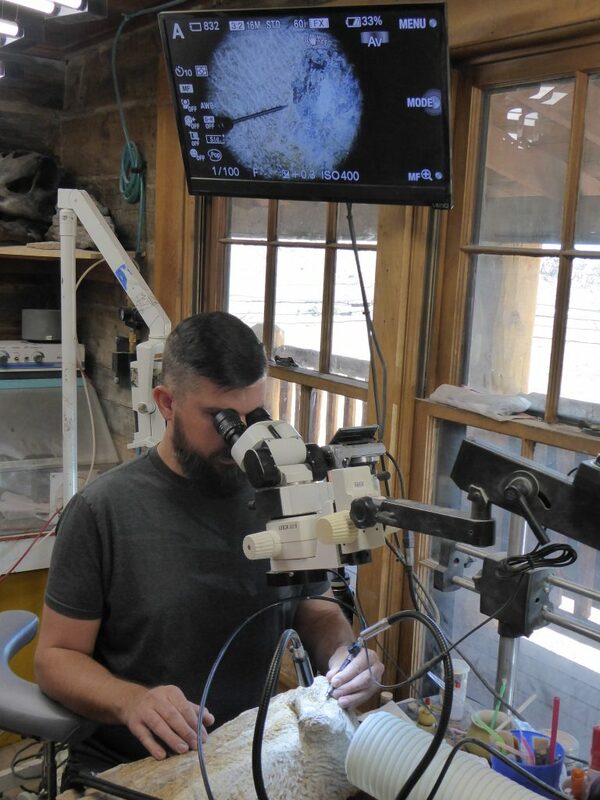 The fossil he was working on had come to the lab after 18 laborious months extracting the specimen from a larger rock, and he was working on a portion that appeared to encase something in addition to the apatosaurus bone. Museum Director Matt works to uncover a dinosaur bone. He hopes it is an undiscovered before. After watching Matt at work, we had the opportunity to work as paleontologists. After putting on the appropriate safety goggles, we received sophisticated machinery and got a chance at breaking away rock, exposing a fossil. It felt like a once-in-a-lifetime experience. However, each tour group goes into the lab, getting the same opportunity, so we can go back and do it again. Our daughter gets some help using the tools to cut away rock to reveal a dinosaur bone. Tours of the museum last 45-minutes to one hour. The tour guides cater the experience to your interests, which makes each tour special. Since it is a small museum, you get the feeling that you are part of the family when you visit. Everyone was very welcoming and had a genuine interest in sharing as much as possible about the history of the region and the unique exhibits. Even though we had 11 people in our group, it felt like each person got a personal tour. There were many opportunities to ask questions, take pictures, and touch the bones. Our tour included seven kids, and each got a chance to share their knowledge about dinosaurs. Our family left learning something new and holding a greater appreciation for the work of paleontologists. You can find out more about the museum here. Follow the Morrison Natural History Museum on Facebook and Twitter. We suggest these other attractions near the museum. We visited Wild West showman Buffalo Bill Museum and Grave Part of Denver Mountain Parks. Our family tackles an Archaeological Dig in nearby Golden, Colorado. Discover 10 Fun Family Adventures in Denver, Colorado. What a cool experience! I would have loved to do that. Paleontologist is one of these fascinating jobs we all dreamt of at one point of our lives, and it’s really nice they let you touch the bones and share a bit of their lab work. It’s definitely not a Natural History Museum like any other! It was a great experience. The kids felt like they were helping out to do important work. Thanks for the add. It was a great experience. Wow! Getting stuck in and getting your hands dirty definitely adds to the experience! Great way to get the kids interested in paleontology! 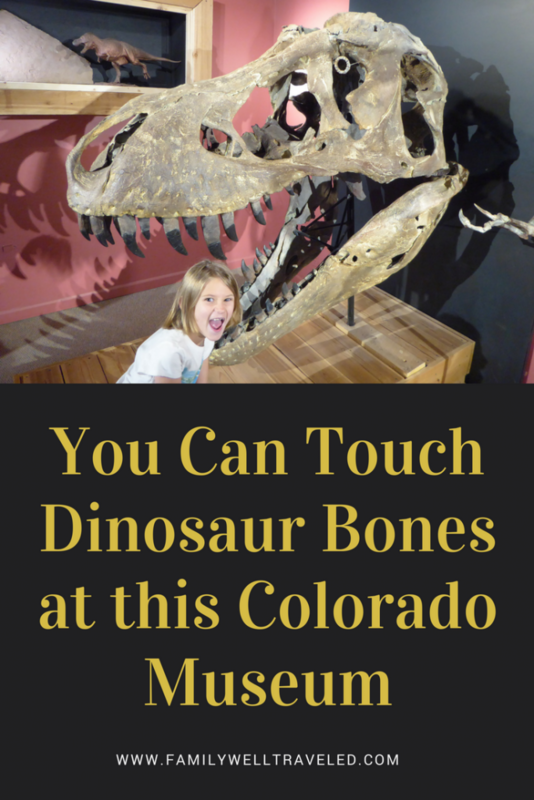 So you can touch dinosaur bones AND snakes? My nephews would love this place! I love the idea of taking a tour like this! It truly feels like you got to have that full immersion experience that helps a child to remember t so much better. Getting to be so hands on just takes the moment to a whole new level for them, bringing history to their fingertips…literally! This is my kind of place. Who doesn’t love dinosaurs and to be able to actually do things with them…amazing. Every kid should go. How cool!! What a unique experience! It would be really awesome to visit this museum sometime. I love museums that are interactive and hands-on like this one! We do too. It makes the subject matter come to life (in this case not literally, but you know what we mean). The most enjoyable museums are the ones that have interactive exhibits. This place looks amazing! Oooh! That’s right up my street, as I studied archaeology, and I’ve worked on a number of digs. I’ve been in Denver, but had no idea this was close by, There’s a lot there I’d like to explore, so definitely one to remember for a future trip. I would be happy to say hi to Sylvia too. My son goes bananas for anything Dinosaurs. We have visited several museums, but had not yet heard about this one. It is not on our list to visit. What a fun experience for you guys!